Last Chance for Swim Lesson Intensives! There’s just one swim lesson intensive left for the summer. If you haven’t yet tried a swim lesson intensive, find out what you’re missing! These popular 30-minute lessons (available for Frog level and above) take place every day, Monday–Thursday for two weeks. Give your children an extra boost in swimming before the school year starts! 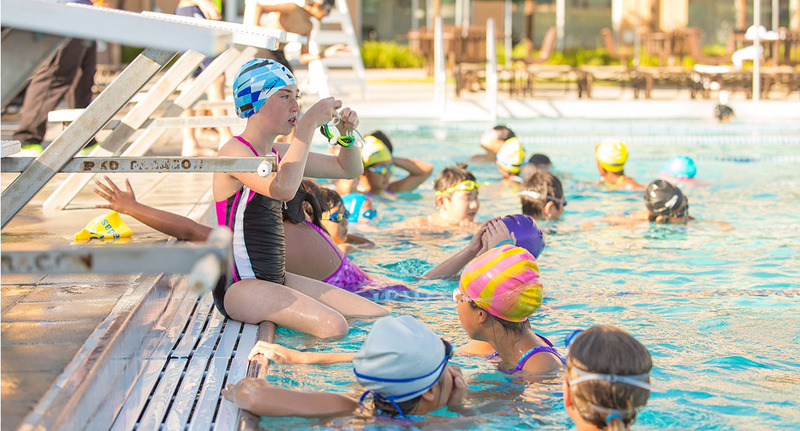 Due to popular demand, we’re offering something new: Mini Swim Lesson Intensives! Enjoy the option of convenient mini-sessions, consisting of three classes, each held once a week for three consecutive weeks. Intermediate swimmers focus on stroke technique, breathing patterns, and introduction to breaststroke and butterfly. For more information or help signing up, please contact our Aquatics Office at 650.378.2782 or aquatics@pjcc.org. If you missed July due to vacation plans, we still have room in our July/August sessions. Register for the remainder of the session and receive a pro-rated price! In addition, mark the date: November/December registration opens on Wednesday, August 1. Not sure of your class level? Take advantage of a free swim evaluation. Our swim instructors will meet with your child in the water to assess their swim proficiency and place them in the appropriate level. Call our aquatics office to schedule your evaluation today! For questions or account help, please contact the Aquatics Office. Missed Classes: We do not offer make up classes for missed classes. In some cases, we will honor a doctor’s note if a physician saw the child, and will arrange for a swim lesson credit. (L–R): Teacher Fabricio hails from El Salvador and is fluent in Spanish. Teacher Eli enjoys water polo and wrestling, and in the fall will head toward Reno to attend the University of Nevada. When Teacher Clay isn’t playing soccer, he can be found rooting for his favorite team, the Los Angeles Galaxy, and fellow sports enthusiast Teacher Megan plays competitive volleyball. Teacher Hannah loves to tap dance and Teacher Alyssa, a graduate of Middle College in San Mateo, will continue her education this fall at San Francisco State. Last but not least, Teacher Cat has an adorable two-year old daughter named Summer who will learn how to swim from her favorite instructor—her mother. A winning team, both in the water and out! Wonder what’s next after the Seals level? Try out for our awesome Barracudas swim team! We offer three levels: Bronze, Silver and Gold, each practicing up to five days a week, Monday–Friday, year-round. Learn more! Center Members ONLY are permitted to stay and swim after classes. If your child does not have a Center Membership in addition to their swim class registration, they are not permitted to use the indoor or outdoor pools after swim class. Remember, Center Members enjoy up to a $50 discount on swim class fees per session! To learn more, visit the Membership Office. Please limit your towel usage to one towel and remember to keep showers short so that everyone may enjoy the use of the family locker rooms. Reusable swim diapers are required for all children who are not yet fully potty trained. You can purchase these at stores such as Target, or buy them at the Front Desk. We do not allow water wings. We only allow Coast Guard Approved flotation devices. An appropriate flotation device is clearly marked Coast Guard approved (Lifeguard jackets, Puddle Jumpers, etc). Interested in becoming part of the Aquatics team? We’re looking for dedicated staff to lifeguard, teach swim lessons, and coach our Barracuda youth swim team. Please contact Aquatics Manager, Courtney Smith.